Give your boat the sound it deserves with the XS-MP1620 marine speakers. 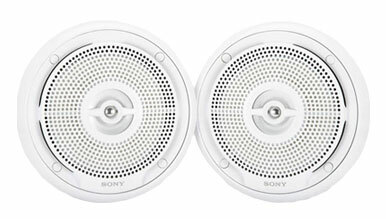 These 2-way speakers deliver great sound thanks to the 6.5-inch polypropylene woofer and 2-inch tweeter. In addition to 160 watts of total power handling, these speakers are designed to withstand the elements including UV rays, salt water and spray. Dimensions (Approx) Depth : 2 1/2"